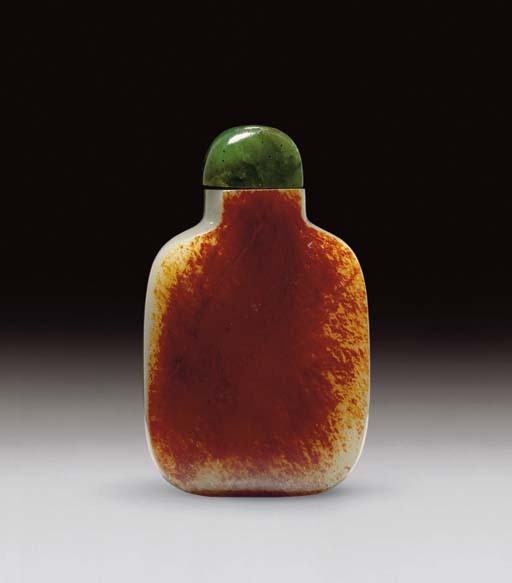 There is a distinctive group of snuff bottles, dated to the mid-Qing, made of white nephrite with only the natural russet-brown skin of the pebble as decoration. It would appear that the raw material used in the manufacture of these bottles would have been cut from a fairly large boulder or pebble, since the curve of the boulder may be guessed at by the disposition of the russet skin. The skin on the present lot has a sumptuous texture and brilliant color, and the material has been enhanced by the flat plane of one side, perfectly complemented by the stopper carved to fit. See three very similar bottles, a pair from the collection of Edith Griswold, illustrated by L.S. Perry, Chinese Snuff Bottles. The Adventures & Studies of a Collector, p. 106, nos. 88-9, and another in The Au Hang Collection of Chinese Snuff Bottles, p. 78, no. 98.